^ a b c Okely, Judith. The Traveller-gypsies. New York: Cambridge, 1983., p158. ^ a b c d e f g h Andereck, Mary E. "Irish Travelers." Encyclopedia of World Cultures. Vol. 1: North America. New York: Macmillan Reference USA, 1996. 162–164. Gale Virtual Reference Library. Web. 21 December 2011. ^ Helleiner, Jane (2003). 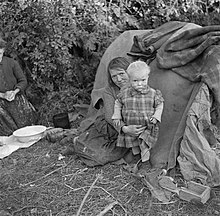 Irish Travellers: Racism and the Politics of Culture. University of Toronto Press. ISBN 978-0-8020-8628-0. http://books.google.com/?id=Zr6VRPmZjV8C&pg=PA29&dq=origins+of+Irish+Travellers. ^ Keane, David. "International Law and the Ethnicity of Irish Travellers." Wash. & Lee Race & Ethnic Anc. LJ 11 (2005): 43. ^ Commission on Itinerancy (26 November 1963) (PDF). Report. Official publications. Pr.7272. Dublin: Stationery Office. http://opac.oireachtas.ie/AWData/Library3/Library2/DL013441.pdf. ^ a b c O'Connell, John (October 1997). “Policy Issues in Ireland”. In Orla Egan. Minority Ethnic Groups In Higher Education In Ireland - Proceedings of Conference held in St. Patrick's College, Maynooth, 27 September 1996. Higher Education Equality Unit. ISBN 1 85918 159 7. http://www.ucc.ie/publications/heeu/Minority/oconnell.htm. ^ Travelling people review body (February 1983) (PDF). Report. Official publications. Pl.1520. Dublin: Stationery Office. http://opac.oireachtas.ie/AWData/Library3/Library2/DL035416.pdf. ^ Task Force on the Travelling Community (July 1995). Report. Official publications. Pn.1726. Dublin: Department of Equality and Law Reform. http://opac.oireachtas.ie/AWData/Library3/Library2/DL029833.pdf. ^ Commission for Racial Equality: "Gypsies and Irish Travellers: the facts"
^ Bhreatnach, Aoife (2006). Becoming conspicuous: Irish travellers, society and the state, 1922–70. University College Dublin Press. pp. 108. ISBN 978-1-904558-61-3. http://books.google.com/?id=yQd1AAAAMAAJ&dq=irish+travellers+feuding&q=+feuding#search_anchor. ^ Travellers owe it to Mullingar to sort out their grievances Westmeath Examiner. 5th August, 2008. ^ Dalton Park rioters given suspended sentences Westmeath Examiner. 24th February, 2010. ^ BBC News: "Councils 'must find Gypsy sites'"
^ “Racism in Ireland: Travellers Fighting Back”. Red and Black Revolution (Workers Solidarity Movement) (2): p. 23. (1996). http://struggle.ws/pdfs/rbr2.pdf 2013年8月12日閲覧。. Bhreatnach, Aoife (2007). Becoming Conspicuous: Irish Travellers, Society and the State 1922–70. Dublin: University College Dublin Press. ISBN 1-904558-62-3. Bhreatnach, Aoife; Breathnach, Ciara (2006). Portraying Irish Travellers: histories and representations. Newcastle-upon-Tyne: Cambridge Scholars Press. ISBN 978-1-84718-055-1. Burke, Mary (2009). 'Tinkers': Synge and the Cultural History of the Irish Traveller. Oxford University Press, USA. ISBN 0-19-956646-1. García Grande, María Remedios (2010年). Ni una palabra más. Celaya Barturen, Beatriz; ISBN 978-84-614-1053-8. Merrigan, Michael (2009). Is there a Case for Indigenous Ethnic Status in Ireland (pp. 101–115, Féil-Scríbhinn Liam Mhic Alasdair:Essays Presented to Liam Mac Alasdair, FGSI). Dublin: Genealogical Society of Ireland. ISBN 978-1-898471-67-7. Ó hAodha, Micheál; Acton, Thomas (eds.) (2007). Travellers, Gypsies, Roma: The Demonisation of Difference. Newcastle-upon-Tyne: Cambridge Scholars Press. ISBN 978-1-84718-055-1. Sánchez, Eleuterio (1977年). Camina o revienta: memorias de El Lute. Cuadernos para el diálogo. Thouroude, Guillaume (2012). Voyage au pays des Travellers : (Irlande, début du XXIe siècle). Paris: Cartouche. ISBN 978-2915842845. .
Friends, Families and Travellers. Advice and Information for Gypsies and Travellers, a UK-based charity. "Ireland's biggest minority group." CNN.